Neil McMillan is a postdoctoral researcher in the psychology department at the University of Alberta. Neil completed his undergraduate degree (a BSc(Hons)) in 2007 with Angelo Santi at Wilfrid Laurier University in Waterloo, ON and then moved on to graduate school at the University of Western Ontario. He completed his MSc and later his PhD (in 2013) under the supervision of Bill Roberts. We have something in common there as I did a postdoc with Bill Roberts back in the mid 90s. We talked about a few things in this episode, including my bizarre inability to remember Neil's name for like the past 3 years. His recent JEP paper with his two postdoc supervisors was another topic that we got in to, they have found an effect in reversal learning that you should read about. Finally, we also talked about the future of the discipline. Thanks again to Red Arms for the background closing music. Buy their music now. It's great you're doing this, Dave! I enjoyed Neil's description of his 'reversal learning meets timing' work, and in general, it's always interesting to me (and, I hope, to my students) to hear the path researchers have taken to get where they are. Toward the end, you ask whether comparative cognition will "fall under the neuro spell". In my opinion, some of the most interesting research in our field has been the result of good behavioural measures coupled with comparative, developmental, and neuroscience frameworks. Research on number is a great example of this. 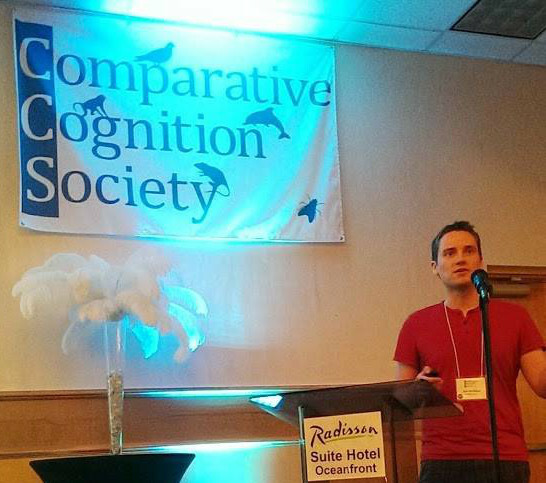 I wonder a lot about the impact of neuroscience on comparative cognition. I have a lot of sympathy for the neuro approach, indeed, I teach a brain and behaviour course and I love it. I just think sometimes we pay too much attention to neurons and not enough to behaviour. Maybe a better way to put that is that we sort of seek legitimacy sometimes by saying 'yeah and I know where that happens in the brain'! Glad you like it so far, more this week.